Join in the celebration as Hannah and Don Johnson open their Scott Depot studio for their holiday open house! Hannah’s signature maple leaf has charmed shoppers for decades and this year’s offering will feature both classic and exciting new works of art. 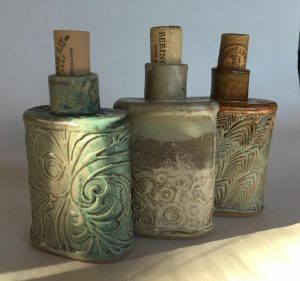 Shop for handmade flasks (above, ornaments, art for home and garden and gifts for everyone on your list! Hannah’s Pottery is located at 6 Thoroughbred Road in Scott Depot, halfway between Huntington and Charleston, West Virginia. For more information, call 304757-9303 or see more of Hannah’s Pottery at their website. Follow this link for easy-to-follow directions.